Since its proposal in 2008, Native Americans have been at the forefront of the push against TransCanada’s Keystone XL Pipeline. These indigenous voices are vital to the XL discussion as the proposed 1,179 mile path would directly effect their communities, altering the environmental and economic state of many reservations and Native communities. Native protesters have been present for every development, steadfast in their demand for justice. Despite the bill’s Congressional passage on Thursday, the momentum Natives have built is something the Lakota People’s Law Project fully supports. 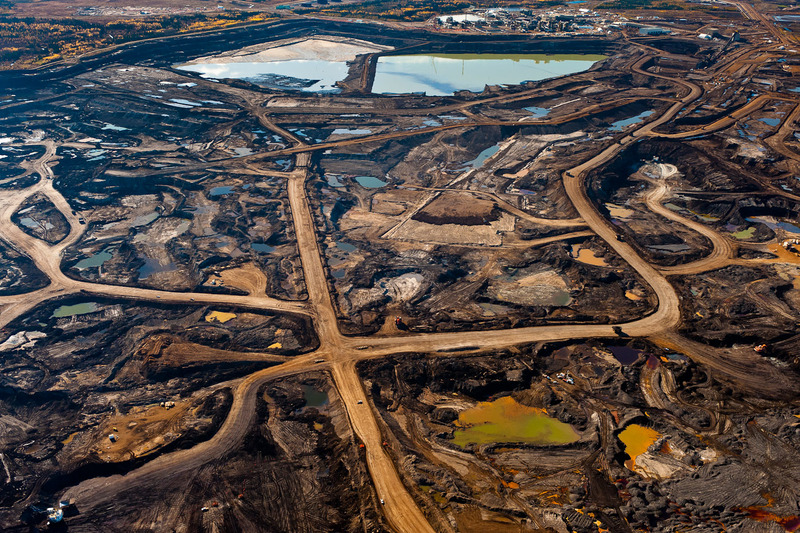 The Keystone XL Pipeline would link Canada’s tar sands (pictured below) to Nebraska, where it would branch off to preexisting oil lines that lead to Gulf Coast refineries. Supporters stand by the assertion that this $8 billion project would provide a multitude of jobs and increase energy security by solidifying ties to our affable neighbor, Canada. Unfortunately, any job opportunity would be temporary as the pipeline will, of course, be fully constructed shortly after its approval. Further, economic benefits for the United States are not compelling. Our country’s land would act as a middle ground between a Canadian oil company and their exportation zones, with little in the way of economic stimulus between the two. “This is the fourth sign: The land will be crossed by snakes of iron,” Hopi Indian White Feather of the Bear Clan once prophesied. Natives of today are, indeed, faced with this monumental truth. Now, the menacing iron snake of the the Keystone XL pipeline threatens to break tribal boundaries laid out in the Fort Laramie Treaties of 1851 and 1868. “The House has now signed our death warrants and the death warrants of our children and grandchildren. The Rosebud Sioux Tribe will not allow this pipeline through our lands,” stated Cyril Scott, Rosebud Sioux Tribe President, to RT. He went on to call implementation of Keystone XL an “act of war” against his people. Natives are fighting back against this violent act, leading protests across the country, many of which have occurred just outside the White House gates. Groups such as the Indigenous Environmental Network and NO TO KXL actively organize demonstrations in response to political movement of the bill. 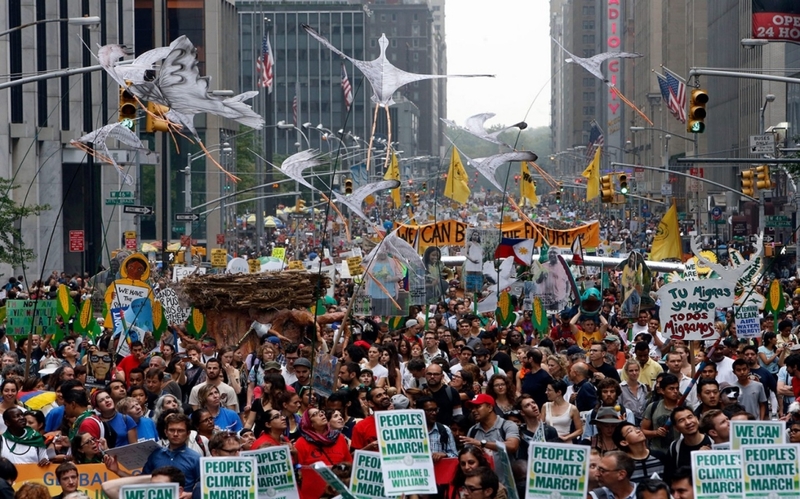 September’s People’s Climate March, held in New York City, attracted up to 400,000 people passionate about environmental justice. The Native presence here was strong–indigenous people from around the world sang, dance, and rallied for the rightful treatment of the land. 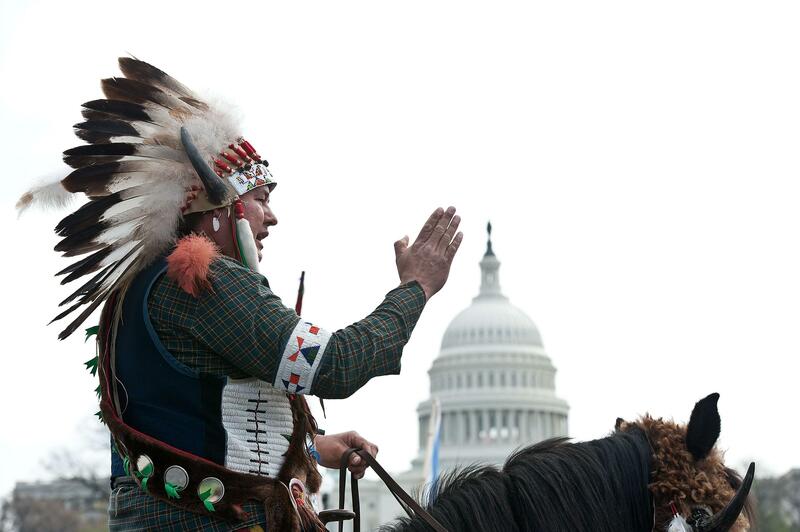 In November, Greg Grey Cloud was arrested for singing a celebratory Lakota song outside of the Congressional chambers immediately following the postponement of Keystone XL passage. His is yet another Native voice making an impact on and around the political discourse of Washington DC. The Keystone XL proposal now lies in the hands of President Obama, who has established clear opposition to the pipeline and an intent to veto. The Senate must reach 67 votes in order to override this executive disapproval. With 53 Republicans and 9 Democrats currently on board, political advocates of the Keystone XL must rally 5 more supporters in order to push through. The fight is not yet over. As long as this bill remains in existence, pressure must be maintained in order to eliminate the possibility of another environmental and social catastrophe. The Lakota People’s Law Project stands with Native activists who refuse to fall into a pit of complacency and would rather advocate on behalf of their land. It is my hopes that the Native Americans can stop this pipeline! I have signed every petition to stop it but the government is not listening. Even if the Senate gets a veto proof vote, since a declaration of war against the native peoples are required, and the president is the commander and chief of the military, couldn’t Obama just choose to declare peace thus rendering any such vote null and void unless they avoid any and all tribal lands and the construction? Obama could also decide to prevent any military forces from being used to enforce the pipeline construction. The tribes won’t need to declare war if they hold firm and blockade while speaking the declaration of peace from president obama. This Pipeline will put PROFITS ABOVE PEOPLE, AGAIN & WILL destroy the LAND of OUR PEOPLE & SHOULD BE STOPPED!